Cody Willoughby | Troy Daily News Ellie Campbell, 6, of Piqua leads a parade of participants up the bleachers during the Freedom Climb on Sunday at Troy Memorial Stadium. Cody Willoughby | Troy Daily News Participants of all ages take to the stadium track to complete four laps during the Freedom Climb on Sunday at Troy Memorial Stadium. 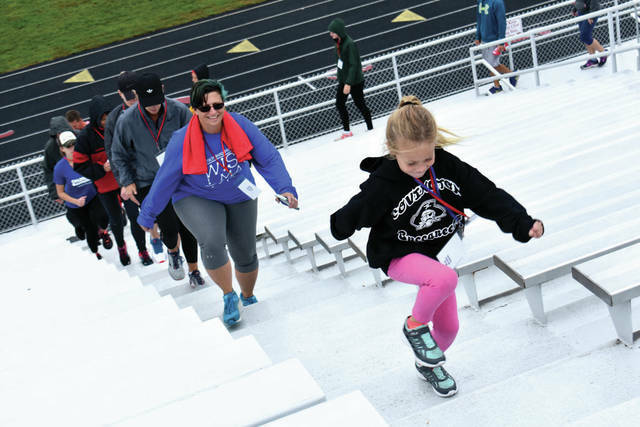 Cody Willoughby | Troy Daily News Ashtyn Wilson of Piqua leads a group of participants on a descent down the bleachers during the Freedom Climb on Sunday at Troy Memorial Stadium. 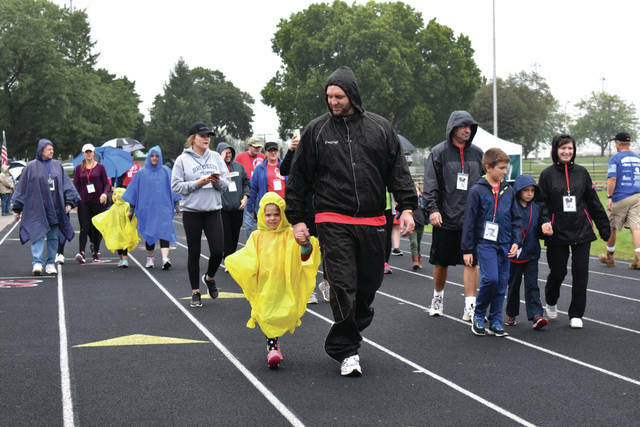 TROY — Hundreds of Miami County residents braved scattered showers to come together in remembrance of the nearly 3,000 lives lost on Sept. 11, 2001 during the second annual Freedom Climb at Troy Memorial Stadium on Sunday. Approximately 110 participants pre-registered for the event, with many more registering on the day of the climb. The $25 admission included a commemorative t-shirt and a hot lunch, with all proceeds benefitting the National Law Enforcement Memorial Fund, the National Fallen Firefighters Foundation, the Troy Police Officer Association, and the Troy Fire Department. The event was founded by Joe Stutz, retired sergeant for the Troy Police Department, along with son Zachary Stutz. The event opened with a color-posting presentation by Honor Guard members from the Troy Fire Department and F.O.P. Lodge 58, the National Anthem, and a prayer led by Mayor Mike Beamish and Miami County Commissioner Greg Simmons. 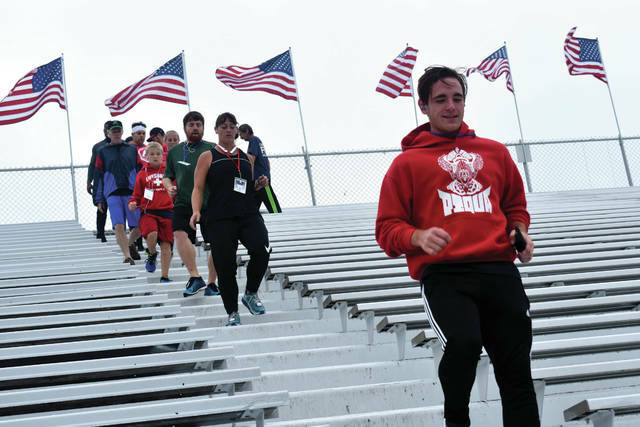 Participants then climbed the stairs of Troy Memorial Stadium 64 times, equivalent to the 1,980 stairs that made up the 110-story height of the World Trade Centers. Participants also had the option of completing four laps around the stadium track to reach the same number of steps. Each climber also wore the name, title, and photo of one of the 343 firefighters, 60 police officers, and 10 emergency medical technicians who perished during the events of 9/11. Stutz described the event as a way to maintain pride among Miami County residents in their country and in first responders both locally and nationally. Separate donations were accepted for Jason Holfinger, the Troy firefighter who passed away earlier this year, with proceeds being presented to Holfinger’s surviving wife and three children. The event was made possible by support from Abbey Credit Union, Anytime Fitness, Can’t Stop Running, Harren’s Market, Kettering Health, Mercer Group, Miami Acres Animal Hospital, Optimist International, Troy Board of Education, Troy City Schools, Staples, and Storypoint. https://www.tdn-net.com/wp-content/uploads/sites/21/2018/09/web1_Climb1-2.jpgCody Willoughby | Troy Daily News Ellie Campbell, 6, of Piqua leads a parade of participants up the bleachers during the Freedom Climb on Sunday at Troy Memorial Stadium. https://www.tdn-net.com/wp-content/uploads/sites/21/2018/09/web1_Climb2-2.jpgCody Willoughby | Troy Daily News Participants of all ages take to the stadium track to complete four laps during the Freedom Climb on Sunday at Troy Memorial Stadium. https://www.tdn-net.com/wp-content/uploads/sites/21/2018/09/web1_Climb3-2.jpgCody Willoughby | Troy Daily News Ashtyn Wilson of Piqua leads a group of participants on a descent down the bleachers during the Freedom Climb on Sunday at Troy Memorial Stadium.